The Pondmaster® AP-Series air pumps have been designed to satisfy the requirements of a multitude of water-related application. 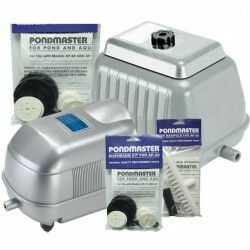 All PondMaster AP-Series air pumps operate on standard 110V electric and come with 6’ power cords. They have been designed to operate efficiently with a motor that is non-oil lubricated. For outdoor applications, it is recommended that the water resistant ABS plastic unit be enclosed with allowance for air circulation to protect it from the elements.